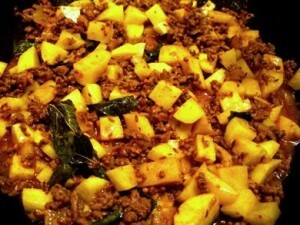 Aloo Qeema recipe by Faranaz at DesiRecipes.com. 2 grams medium onions skinned and finely chopped. 450 grams minced meat (keema). 1 tea spoon ginger , minced. 1 tea spoon chili powder. 1 tea spoon coriander powder. 1 tea spoon turmeric powder (haldi ). 1 level tea spoon salt . 300 grams potatoes (peeled and cubed). 3 table spoons coriander leaves , chopped. Fry onions in a heavy based sauce pan over medium heat, stirring time to time. When onions are soft but not brown add minced meat, garlic and cook over medium heat. Stirring all the time, cook for 35 minutes or until all the moisture has dried up and meat turns brown. Add chili powder, coriander powder, turmeric , salt and 3 table spoon water and stirring constantly, cook for 2 minutes. Add chopped tomatoes and yogurt and cook for five to ten minutes, stirring all the time. Add a little water if feel necessary during the process. Add potatoes and mix it well, add one cup of water, cover and cook for 30 minutes over low heat or until potatoes are cooked. If water dries before potatoes are cooked, add more water. Add garam masala, green chilies and coriander leaves . Mix well and serve hot with Chapatis.